He said, "I also want to say that your courage is exceptional. If you aspire to be anything in a country of about 200 million people, you are a courageous person, no question about that, because when you count the number of people who hold elective offices in this country, they are very few when compared to the population. So, what you are searching for is really coveted, and is not a walk in the park. I really salute your courage," he said. 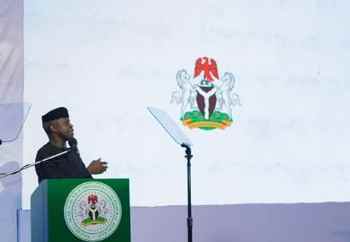 The VP then congratulated the aspirants for having gone "this far in the game, that you are not just sitting down at home, not just getting upset with yourself on Social Media. You are putting your money, resources and your time where your mouth is. So, consider yourself in very exceptional company. This is a group of people who have not lost hope, but are very determined to ensure that things work." He said, "I strongly believe that the future of our party depends on people who are committed to see that we build a party that is based on ideals that you and I think are important. As a young person, I belonged to several pressure groups. I graduated at the age of 21. And when I graduated, I began to participate in various pressure groups, human rights organisations, anti-corruption, civil society groups of every kind. When political parties started forming, we could not aspire, but we remained involved. My fIrst involvement in government was when l was appointed as Attorney General in Lagos State. "For seven years after serving as Lagos Attorney-General I was part of the party, I did not have a board appointment or anything, but I kept working for the party. I kept working for the party as a lawyer. Most of those cases we were not paid a dime. But we went from place to place. Sometimes we didn't even have a place to stay when we went to court the next morning. So, there is a measure of paying the price, it depends on how serious or committed we are to some of the things we say we are commute to. "I believe that, in party politics, we must go beyond positions, whether elective or appointed, but we must be committed to something, the principles and beliefs of those who are the forebears of that party," he said. The Vice President added, "We are in a place where we are the ones who can make the difference. Nothing is going to change overnight, but we can make efforts to change the process. We can do a lot more, but it depends on our commitment. I like the idea of young people getting a quota in the party structure to run for office on some level, such as the state houses of Assembly." Some of the aspirants had earlier raised the issue of allowing quotas to young people in elective offices. According to the VF? "It is up to us to fight at every stage to see the ideals that we desire; we will win, in the end, if we are consistent. Our party is stronger if our young people are determined to make a change and a difference, even from within. We would see what can be done to ensure that women and youths are more involved in party politics."